Why Study Compost as Bedding for Horses? The purpose of this project was to study and promote the use of compost as an alternative horse stall bedding and encourage horse owners and managers to think more creatively about manure management. Our objective was to reduce bedding use, and improve manure management practices at equine facilities in Snohomish County, Washington State. Recreational and professional horse owners contribute to maintaining agricultural open space and supporting the agricultural infrastructure and local economy. Horse owners have historically been overlooked as contributors to animal agriculture, and as a result many horse owners lack a basic knowledge about manure and nutrient management. They are not aware of their impact on water and soil quality. Disposal of used stall bedding is costly for horse owners in northwestern Washington State, and has a potentially large impact on water quality. Disposal practices often include filling in low spots and ravines, or building massive piles. Composting manure at high temperatures eliminates pathogens and parasites, stabilizes nutrients, and reduces odors and vector attraction. The Snohomish Conservation District (SCD) worked with ten commercial and two private equine facilities to test the use of compost as an alternative horse stall bedding material. Facilities ranged in size from 5 to >20 stalls. The primary system used for composting and reusing bedding involved a micro-bin composter (O2 Compost, Snohomish, WA) and a Stall Sh*fter® (Brockwood Farm, Nashville, IN). Micro-bins were assembled on-site and filled with used stall bedding (Fig.1-2). After 30 days of composting, the bin was emptied and the manure was separated from the bedding (Fig. 3). 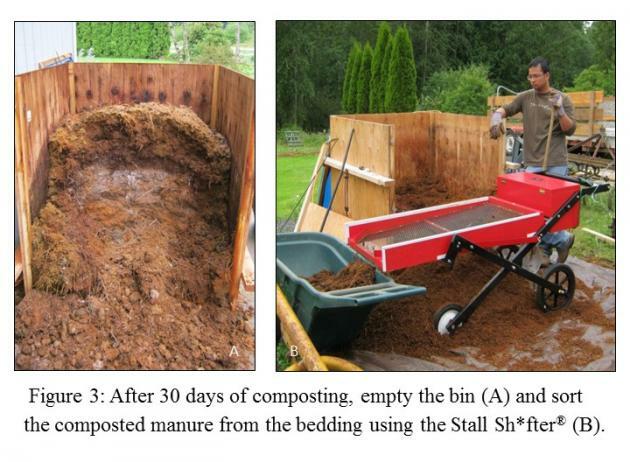 The composted bedding was then used in a stall (Fig. 4). Equine facility managers provided feedback on the effectiveness, perception, and impacts of using the compost as stall bedding. Results varied between trial sites based on type and quantity of bedding used, season, and stall management practices. Composted stall waste makes a soft absorbent bedding for horses or other livestock. Composted bedding is less dusty than shavings or wood pellets, darker in color, and has a pleasant earthy odor. There were no reports of composted bedding increasing stall odors or flies, or negatively impacting horse health. The best results were reported when mixing the composted bedding with un-composted bedding in equal proportions or two parts compost to one part bedding. There were some reports of horses with skin and respiratory conditions improving during the time they were on composted bedding, including thrush in the feet, hives and “rain rot” on the body, and “scratches” on the legs. When separating the composted manure from the bedding, the amount and type of bedding determines the effectiveness of a bedding re-use system. Concern about appearances was more prevalent than concern about disease or parasite transfer. Even though barn managers were not entirely ready to make the switch to composted bedding, this project helped start many conversations (in person, through publications, and social media) about manure management and resource conservation. It was a great opportunity to help horse owners make the mental leap from “waste” to “resource”. 1. Developing systems for making composted bedding that are practical on a large scale and provide an economic incentive for large equine facilities to recycle their waste. 2. Outreach and education programs directed at horse owners who board their animals at commercial facilities. Would some horse owners be willing to pay a premium to board their horses at a facility that is managed in an environmentally sustainable manner? 3. Clinical trials to examine the effects of composted bedding on skin and respiratory conditions. I would like to thank all of the farm owners and managers who very graciously participated in this project and were willing to try something new. The contribution of time and energy is very much appreciated. Thanks also to the staff at O2 Compost for their efforts, ideas, and creativity. This would not have been possible without them. And Mollie Bogardus for helping take this project to the next level, and explore all the possibilities.